The Omega Speedmaster Professional is the watch that seems to be the back bone of my watch collection and interest in mechanical wrist watches. It is the watch that started the whole madness for me. That’s probably why it is in the header picture of this website anyway 🙂 I have to admit though, that there are periods that I almost never wear mine and that it gets almost no attention at all. However, with the slightest trigger the whole obsession with this watch start all over again. The latest trigger has been a small GTG with a few long time watch friends. One of the guys was wearing this very rare Speedmaster Professional ref. BA 145.022. He also brought the original box which is a relief “Lunar surface” box which is probably even more rare. Although this watch is not considered to be Omega’s holy grail Speedmaster, it is highly sought after. The first 28 pieces had the following inscription in its caseback: “to mark man’s conquest of space with time, through time, on time”. 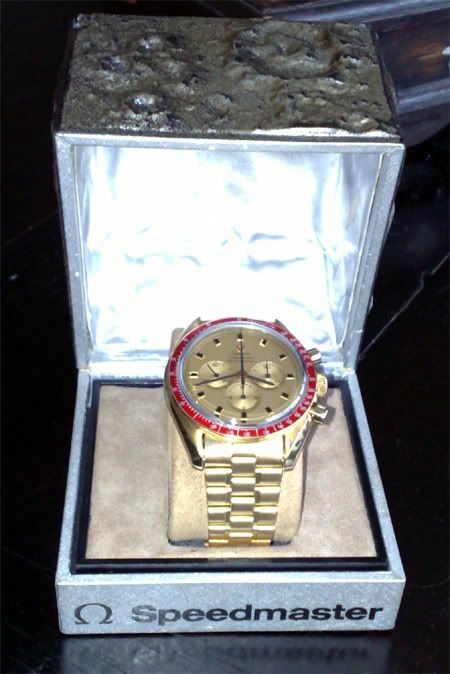 Including the number of the watch and the name of the recipient. The other watches had the “the first watch worn on the moon” text (horizontally) engraved. During a gala dinner on the 25th of November 1969, at the Hotel Warwick in Houston, approximately 26 pieces were offered to the NASA astronauts. The number 1 and 2 watch, offered to the president and the vice-president (Spiro Agnew), is on display in the Omega Museum since 1999. 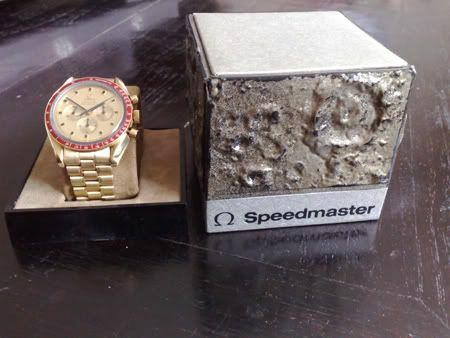 Last saturday I had the opportunity to observe one of these 1014 special time pieces, and its original box. Please see the pictures below. This model has the “First watch worn on the Moon” engraving, filled with the maroon color. The first time pieces with this engraving, had a smaller font type and were only engraved (not filled-in). The owner of this watch wants to remain anonymous. Inquiries are not appreciated.